Goldfield Productions have full funding to record the first CD of the chamber music of ERIKA FOX for NMC Recordings. 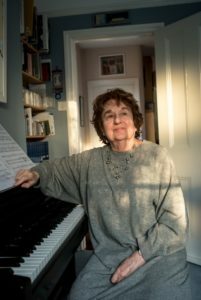 Erika is 81 and an astonishingly good composer whose music we only discovered 18 months ago. She was very active in the 1970s and 80s but her work has almost vanished without trace. She now has a new website This landmark project will mark the first commercial recording of Erika Fox’s music. ‘The originality and strength of her musical language is so striking that its general lack of promotion and exposure is baffling. Here is an authentic composer of absolute integrity whose music demands to be heard’.